The other day mocards brought it to my attention that our Non-Sports selection is not very prominent on the site, and it is relatively hard for people to discover that we sell cards other than sports cards. I got to thinking about what should be done. I wasn’t convinced that the 2,000 non-sports cards currently available warranted a permanently visible link on our header. All the permanent links have at least 50,000 listings each. So I thought about how the non-sports cards looked from Google, since that is where we get the majority of our new traffic. It turns out that when we added support for non-sports cards a little while ago, I never finished the plumbing that actively pushed that category to Google’s shopping service. So we were at the mercy of whenever Google happened crawl that portion of our site. Though they do a great job of crawling our site, we have many millions of pages, so it can take a while. In any case, I fixed that the other day, and now if you search Google for any non-sports content that we have, you are likely to get a hit on the first page. In mocard’s case, I noticed that he has a number of 1959 Indian Trading Cards. 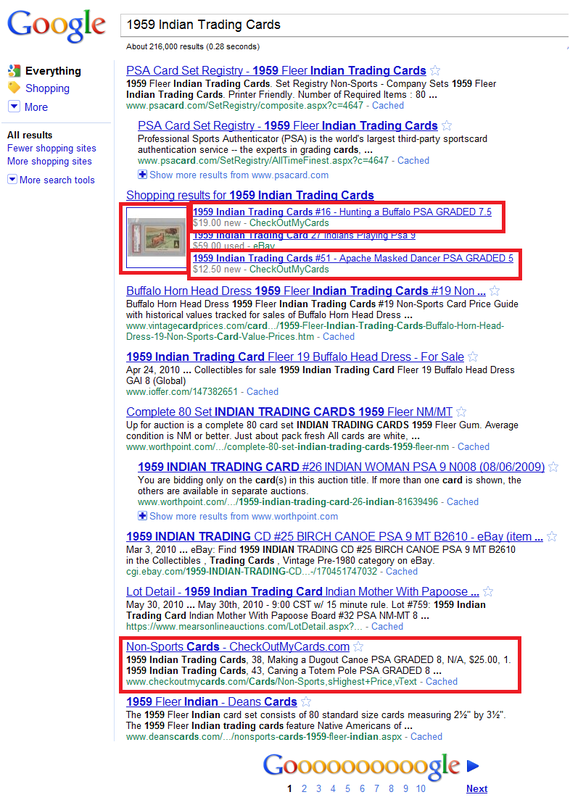 So tonight I tried searching Google for “1959 Indian Trading Cards”, and voila… we now have 4 links on the first page. This entry was posted in new features and tagged mocards. Bookmark the permalink. Impressive use of SEO. Keep up the good work. Woo hoo! I just sold some. THANK YOU, Checkoutmycards! Where are you guys at when it comes to supporting more Non-Sport Brands? I have thousands but havent sent any in cause they weren’t on your list. Any updates on Pokemon, Yu-Gi-Oh, Garbage Pail Kids, and other more recent brands that are more in these days? If you can find it on the Beckett website, we support it. Pokemon and Yu-Gi-Oh are not currently available, but Garbage Pail Kids are supported.